Jan. 28, 2019 | Being far from home but in the Arkansas SAVES network may have saved Donny Koger’s life. A resident of Oklahoma City, Koger was in a wilderness area of Polk County on the western border of Arkansas late in the evening of March 16 when he suddenly found he was unable to speak and was paralyzed from the neck down. With the onset of paralysis, Koger started falling, but his wife, Rebecca Koger, and some friends nearby caught him before he hit the ground. The Kogers were about to discover that their remote location was closer to help than they might have thought. Mena Regional Health System, an AR SAVES hospital, was less than an hour away. The tele-stroke network, the Arkansas Stroke Assistance through Virtual Emergency Support (AR SAVES), uses a high-speed video communications system to help provide immediate, life-saving treatments to stroke patients 24 hours a day. The real-time video communication enables a stroke neurologist to evaluate whether emergency room physicians should use a powerful blood-clot dissolving agent, alteplase, within the critical four-and-a-half-hour period following the first signs of stroke. Donny Koger and his wife, Rebecca, talk with Sanjeeva Onteddu, M.D., and Adewumi Amole, M.D., through a live, AR SAVES video network connection at Mena Regional Health System. Before Donny even thought of stroke that night in the forest near Mena, he was concerned about another health issue, a prostate problem unrelated to his stroke. Donny had noticed blood in his urine and told his wife that they probably needed to return to their camp and possibly go to a hospital. Rebecca had started to tell their friends what they were going to do when Donny suddenly felt weak and disoriented. That’s when he started to fall. Rebecca and a friend’s daughter recognized the stroke signs. By the time, she and their friends had gotten Donny back to their camp site, an ambulance was there and ready to take Donny to the Mena hospital. The stroke team at Mena Regional ordered a CT scan for Donny and it showed no evidence of brain bleeding, indicating that he could possibly benefit from the clot-busting alteplase. “I remember thinking, ‘This is going to change his whole life, and how is his wife going to take care of him if he doesn’t recover,’” said Olivia Bayne, an R.N. in the Emergency Department at the Mena hospital. For Bayne, it was her first stroke case, and it would prove to be a challenging one for everyone trying to care for Donny. Bayne assisted another nurse in the department as they connected to Sanjeeva Reddy Onteddu, M.D., medical director for AR SAVES, through the AR SAVES network. Onteddu said Donny’s case warranted giving him alteplase. After that, Donny was transported via air ambulance to UAMS Medical Center for further treatment. While Donny was being airlifted to UAMS, Rebecca and several friends drove to Little Rock. By the time they arrived, family from Oklahoma City was there to meet them. The UAMS stroke team had determined Donny was having a spinal cord stroke. The Kogers share a laugh with staff of AR SAVES program and the Mena Regional Health System during a visit to Mena in December. Adewumi Amole, M.D., the UAMS interventional neuroradiologist who performed the procedure explained that spinal cord strokes are so uncommon that he had never treated one. Furthermore, the artery’s small size, less than a millimeter across, presented a challenge. None of the conventional surgical devices fit it. When the physicians came out of the operating room four hours later, almost 16 hours after his first symptoms, Amole pulled his mask down and smiled. Donny’s family and friends were ecstatic, Rebecca said. Donny said it was probably two months before he really felt he was recovered and another two months before his energy level was normal. Rebecca said her husband was very self-disciplined about his physical therapy and rehabilitation. 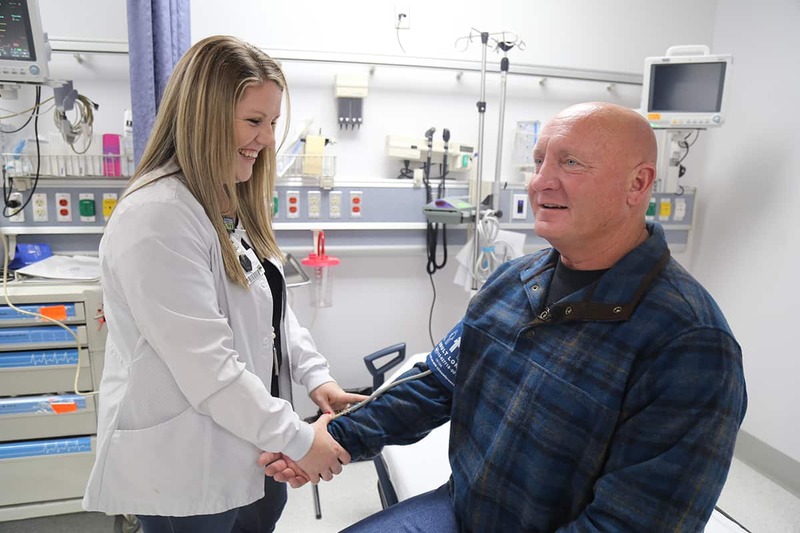 When he came back to see stroke neurologist Krishna Nalleballe, M.D., in clinic he realized that Donny could have ended up coming to clinic on a stretcher rather than walking. Although Donny does sometimes have to ask people to repeat themselves when speaking, he usually can understand them the second time. The problem isn’t with his hearing but with processing spoken words. 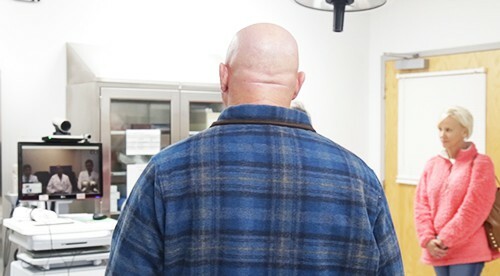 Donny also sometimes has lapses in short-term memory, but these problems have been minor enough that he returned to work in September as a patrolman for the Oklahoma City Police Department. One thing he and his wife are serious about is the absence of something like the AR SAVES network in Oklahoma. Both are in the early stages of becoming health care activists, meeting with health care leaders and state legislators about creating a network and filling that void.